R1001.1 General. Masonry fireplaces shall be constructed in accordance with this section and the applicable provisions of Chapters 3 and 4. R1001.2 Footings and foundations. Footings for masonry fireplaces and their chimneys shall be constructed of concrete or solid masonry at least 12 inches (305 mm) thick and shall extend at least 6 inches (152 mm) beyond the face of the fireplace or foundation wall on all sides. Footings shall be founded on natural, undisturbed earth or engineered fill below frost depth. In areas not subjected to freezing, footings shall be at least 12 inches (305 mm) below finished grade. R1001.2.1 Ash dump cleanout. Cleanout openings located within foundation walls below fireboxes, when provided, shall be equipped with ferrous metal or masonry doors and frames constructed to remain tightly closed except when in use. Cleanouts shall be accessible and located so that ash removal will not create a hazard to combustible materials. R1001.3 Seismic reinforcing. Masonry or concrete chimneys in Seismic Design Categories D1 and D2 shall be reinforced. Reinforcing shall conform to the requirements set forth in Table R1003.1 and Section R609, Grouted Masonry. R1001.3.1 Vertical reinforcing. For chimneys up to 40 inches (1016 mm) wide, four No. 4 continuous vertical bars shall be placed between wythes of solid masonry or within the cells of hollow unit masonry and grouted in accordance with Section R609. Grout shall be prevented from bonding with the flue liner so that the flue liner is free to move with thermal expansion. For chimneys more than 40 inches (1016 mm) wide, two additional No. 4 vertical bars shall be provided for each additional flue incorporated into the chimney or for each additional 40 inches (1016 mm) in width or fraction thereof. R1001.3.2 Horizontal reinforcing. Vertical reinforcement shall be placed within 1/4-inch (6 mm) ties, or other reinforcing of equivalent net cross-sectional area, placed in the bed joints according to Section R607 at a minimum of every 18 inches (457 mm) of vertical height. Two such ties shall be installed at each bend in the vertical bars. R1001.4 Seismic anchorage. Masonry or concrete chimneys in Seismic Design Categories D0, D1 or D2 shall be anchored at each floor, ceiling or roof line more than 6 feet (1829 mm) above grade, except where constructed completely within the exteriorwalls. Anchorage shall conform to the requirements of Section R1001.4.1. R1001.4.1 Anchorage. Two 3/16-inch by 1-inch (5 mm by 25 mm) straps shall be embedded a minimum of 12 inches (305 mm) into the chimney. Straps shall be hooked around the outer bars and extend 6 inches (152 mm) beyond the bend. Each strap shall be fastened to a minimum of four floor ceiling or floor joists or rafters with two 1/2-inch (13 mm) bolts. R1001.5 Firebox walls. Masonry fireboxes shall be constructed of solid masonry units, hollow masonry units grouted solid, stone or concrete. When a lining of firebrick at least 2 inches (51 mm) thick or other approved lining is provided, the minimum thickness of back and side walls shall each be 8 inches (203 mm) of solid masonry, including the lining. The width of joints between firebricks shall not be greater than 1/4 inch (6 mm). When no lining is provided, the total minimum thickness of back and sidewalls shall be 10 inches (254 mm) of solid masonry. Firebrick shall conform to ASTM C 27 or C 1261 and shall be laid with medium duty refractory mortar conforming to ASTM C 199. R1001.5.1 Steel fireplace units. Installation of steel fireplace units with solid masonry to form a masonry fireplace is permitted when installed either according to the requirements of their listing or according to the requirements of this section. Steel fireplace units incorporating a steel firebox lining, shall be constructed with steel not less than 1/4 inch (6 mm)thick, and an air circulating chamber which is ducted to the interior of the building. The firebox lining shall be encased with solid masonry to provide a total thickness at the back and sides of not less than 8 inches (203 mm), of which not less than 4 inches (102 mm) shall be of solid masonry or concrete. Circulating air ducts used with steel fireplace units shall be constructed of metal or masonry. R1001.6 Firebox dimensions. The firebox of a concrete or masonry fireplace shall have a minimum depth of 20 inches (508 mm). The throat shall not be less than 8 inches (203 mm) above the fireplace opening. The throat opening shall not be less than 4 inches (102 mm) deep. The cross-sectional area of the passageway above the firebox, including the throat, damper and smoke chamber, shall not be less than the cross-sectional area of the flue. R1001.7 Lintel and throat. Masonry over a fireplace opening shall be supported by a lintel of noncombustible material. The minimum required bearing length on each end of the fireplace opening shall be 4 inches (102 mm). The fireplace throat or damper shall be located a minimum of 8 inches (203 mm) above the lintel. R1001.7.1 Damper. Masonry fireplaces shall be equipped with a ferrous metal damper located at least 8 inches (203 mm) above the top of the fireplace opening. Dampers shall be installed in the fireplace or the chimney venting the fireplace, and shall be operable from the room containing the fireplace. R1001.8 Smoke chamber. Smoke chamberwalls shall be constructed of solid masonry units, hollow masonry units grouted solid, stone or concrete. The total minimum thickness of front, back and side walls shall be 8 inches (203 mm) of solid masonry. The inside surface shall be parged smooth with refractory mortar conforming to ASTM C 199. When a lining of firebrick at least 2 inches (51 mm) thick, or a lining of vitrified clay at least 5/8 inch (16 mm) thick, is provided, the total minimum thickness of front, back and side walls shall be 6 inches (152 mm) of solid masonry, including the lining. Firebrick shall conform to ASTM C 1261 and shall be laid with medium duty refractory mortar conforming to ASTM C 199. Vitrified clay linings shall conform to ASTM C 315. R1001.8.1 Smoke chamber dimensions. The inside height of the smoke chamber from the fireplace throat to the beginning of the flue shall not be greater than the inside width of the fireplace opening. The inside surface of the smoke chamber shall not be inclined more than 45 degrees (0.79 rad) from vertical when prefabricated smoke chamber linings are used or when the smoke chamberwalls are rolled or sloped rather than corbeled. When the inside surface of the smoke chamber is formed by corbeled masonry, the walls shall not be corbeled more than 30 degrees (0.52 rad) from vertical. R1001.9 Hearth and hearth extension. Masonry fireplace hearths and hearth extensions shall be constructed of concrete or masonry, supported by noncombustible materials, and reinforced to carry their own weight and all imposed loads. No combustible material shall remain against the underside of hearths and hearth extensions after construction. R1001.9.1 Hearth thickness. The minimum thickness of fireplace hearths shall be 4 inches (102 mm). R1001.9.2 Hearth extension thickness. The minimum thickness of hearth extensions shall be 2 inches (51 mm). Exception: When the bottom of the firebox opening is raised at least 8 inches (203 mm) above the top of the hearth extension, a hearth extension of not less than 3/8-inch-thick (10 mm)brick, concrete, stone, tile or other approved noncombustible material is permitted. R1001.10 Hearth extension dimensions. Hearth extensions shall extend at least 16 inches (406 mm)in front of and at least 8 inches (203 mm) beyond each side of the fireplace opening. Where the fireplace opening is 6 square feet (0.6 m2) or larger, the hearth extension shall extend at least 20 inches (508 mm) in front of and at least 12 inches (305 mm) beyond each side of the fireplace opening. R1001.11 Fireplace clearance. All wood beams, joists, studs and other combustible material shall have a clearance of not less than 2 inches (51 mm) from the front faces and sides of masonry fireplaces and not less than 4 inches (102 mm) from the back faces of masonry fireplaces. The air space shall not be filled, except to provide fire blocking in accordance with Section R1001.12. 2. When masonry fireplaces are part of masonry or concrete walls, combustible materials shall not be in contact with the masonry or concrete walls less than 12 inches (305 mm)from the inside surface of the nearest firebox lining. R1001.12 Fireplace fireblocking. Fireplace fireblocking shall comply with the provisions of Section R602.8. MASONRY HEATERSR1002.1 Definition. A masonry heater is a heating appliance constructed of concrete or solid masonry, hereinafter referred to as masonry, which is designed to absorb and store heat from a solid-fuel fire built in the firebox by routing the exhaust gases through internal heat exchange channels in which the flowpath downstream of the firebox may include flow in a horizontal or downward direction before entering the chimney and which delivers heat by radiation from the masonry surface of the heater. R1002.3 Footings and foundation. The firebox floor of a masonry heater shall be a minimum thickness of 4 inches (102 mm) of noncombustible material and be supported on a noncombustible footing and foundation in accordance with Section R1003.2. R1002.4 Seismic reinforcing. In Seismic Design Categories D0, D1 and D2, masonry heaters shall be anchored to the masonry foundation in accordance with Section R1003.3. Seismic reinforcing shall not be required within the body of a masonry heater whose height is equal to or less than 3.5 times it's body width and where the masonry chimney serving the heater is not supported by the body of the heater. Where the masonry chimney shares a common wall with the facing of the masonry heater, the chimney portion of the structure shall be reinforced in accordance with Section R1003. R1002.5 Masonry heater clearance. Combustible materials shall not be placed within 36 inches (914 mm) of the outside surface of a masonry heater in accordance with NFPA211 Section 8-7 (clearances for solid-fuel-burning appliances), and the required space between the heater and combustible material shall be fully vented to permit the free flow of air around all heater surfaces. 2. Masonry heaters tested and listed by an American National Standards Association (ANSI)-accredited laboratory to the requirements of UL1482 may be installed in accordance with the listing specifications and the manufacturer's written instructions. R1003.1 Definition. A masonry chimney is a chimney constructed of solid masonry units, hollow masonry units grouted solid, stone or concrete, hereinafter referred to as masonry. Masonry chimneys shall be constructed, anchored, supported and reinforced as required in this chapter. R1003.2 Footings and foundations. Footings for masonry chimneys shall be constructed of concrete or solid masonry at least 12 inches (305 mm) thick and shall extend at least 6 inches (152 mm) beyond the face of the foundation or support wall on all sides. Footings shall be founded on natural undisturbed earth or engineered fill belowfrost depth. In areas not subjected to freezing, footings shall be at least 12 inches (305 mm) below finished grade. R1003.3 Seismic reinforcing. Masonry or concrete chimneys shall be constructed, anchored, supported and reinforced as required in this chapter. In Seismic Design Category D0, D1 or D2 masonry and concrete chimneys shall be reinforced and anchored as detailed in Section R1003.3.1, R1003.3.2 and R1003.4. In Seismic Design Category A,BorC, reinforcement and seismic anchorage is not required. R1003.3.1 Vertical reinforcing. For chimneys up to 40 inches (1016 mm) wide, four No. 4 continuous vertical bars, anchored in the foundation, shall be placed in the concrete, or between wythes of solid masonry, or within the cells of hollow unit masonry, and grouted in accordance with Section R609.1.1. Grout shall be prevented from bonding with the flue liner so that the flue liner is free to move with thermal expansion. For chimneys more than 40 inches (1016 mm) wide, two additional No. 4 vertical bars shall be installed for each additional 40 inches (1016 mm) in width or fraction thereof. R1003.3.2 Horizontal reinforcing. Vertical reinforcement shall be placed enclosed within 1/4-inch (6 mm) ties, or other reinforcing of equivalent net cross-sectional area, spaced not to exceed 18 inches (457 mm) on center in concrete, or placed in the bed joints of unit masonry, at a minimum of every 18 inches (457 mm) of vertical height. Two such ties shall be installed at each bend in the vertical bars. R1003.4 Seismic anchorage. Masonry and concrete chimneys and foundations in Seismic Design Category D0, D1 or D2 shall be anchored at each floor, ceiling or roof line more than 6 feet (1829 mm) above grade, except where constructed completely within the exterior walls. Anchorage shall conform to the requirements in Section R1003.4.1. R1003.4.1 Anchorage. Two 3/16-inch by 1-inch (5 mm by 25 mm) straps shall be embedded a minimum of 12 inches (305 mm) into the chimney. Straps shall be hooked around the outer bars and extend 6 inches (152 mm) beyond the bend. Each strap shall be fastened to a minimum of four floor joists with two 1/2-inch (13 mm) bolts. R1003.5 Corbeling. Masonry chimneys shall not be corbeled more than one-half of the chimney's wall thickness from a wall or foundation, nor shall a chimney be corbeled from a wall or foundation that is less than 12 inches (305 mm) thick unless it projects equally on each side of the wall, except that on the second story of a two-story dwelling, corbeling of chimneys on the exterior of the enclosing walls may equal the wall thickness. The projection of a single course shall not exceed one-half the unit height or one-third of the unit bed depth, whichever is less. R1003.6 Changes in dimension. The chimney wall or chimney flue lining shall not change in size or shape within 6 inches (152 mm) above or below where the chimney passes through floor components, ceiling components or roof components. R1003.7 Offsets. Where a masonry chimney is constructed with a fireclay flue liner surrounded by one wythe of masonry, the maximum offset shall be such that the centerline of the flue above the offset does not extend beyond the center of the chimney wall below the offset. Where the chimney offset is supported by masonry below the offset in an approved manner, the maximum offset limitations shall not apply. Each individual corbeled masonry course of the offset shall not exceed the projection limitations specified in Section R1003.5. R1003.8 Additional load. Chimneys shall not support loads other than their own weight unless they are designed and constructed to support the additional load. Construction of masonry chimneys as part of the masonry walls or reinforced concrete walls of the building shall be permitted. R1003.9 Termination. Chimneys shall extend at least 2 feet (610 mm) higher than any portion of a building within 10 feet (3048 mm), but shall not be less than 3 feet (914 mm) above the highest point where the chimney passes through the roof. R1003.10 Wall thickness. Masonry chimney walls shall be constructed of solid masonry units or hollow masonry units grouted solid with not less than a 4-inch (102 mm) nominal thickness. R1003.10.1 Masonry veneer chimneys. Where masonry is used to veneer a frame chimney, through-flashing and weep holes shall be installed as required by Section R703. R1003.11 Flue lining (material). Masonry chimneys shall be lined. The lining material shall be appropriate for the type of appliance connected, according to the terms of the appliance listing and manufacturer's instructions. 4. Other approved materials that will resist corrosion, erosion, softening or cracking from flue gases and condensate at temperatures up to 1,800 deg.F (982 deg.C). R1003.11.2 Flue linings for specific appliances. Flue linings other than these covered in Section R1003.11.1, intended for use with specific types of appliances, shall comply with Sections R1003.11.3 through R1003.11.6. R1003.12 Clay flue lining (installation). Clay Clay flue liners shall be installed in accordance with ASTM C 1283 and extend from a point not less than 8 inches (203 mm) below the lowest inlet or, in the case of fireplaces, from the top of the smoke chamber to a point above the enclosing walls. The lining shall be carried up vertically, with a maximum slope no greater than 30 degrees (0.52 rad) from the vertical. R1003.12.1 Listed materials. Listed materials used as flue linings shall be installed in accordance with the terms of their listings and manufacturer's instructions. R1003.12.2 Space around lining. The space surrounding a chimney lining system or vent installed within a masonry chimney shall not be used to vent any other appliance. R1003.13 Multiple flues. When two ormore flues are located in the same chimney, masonry wythes shall be built between adjacent flue linings. The masonry wythes shall be at least 4 inches (102 mm) thick and bonded into the walls of the chimney. R1003.14 Flue area (appliance). 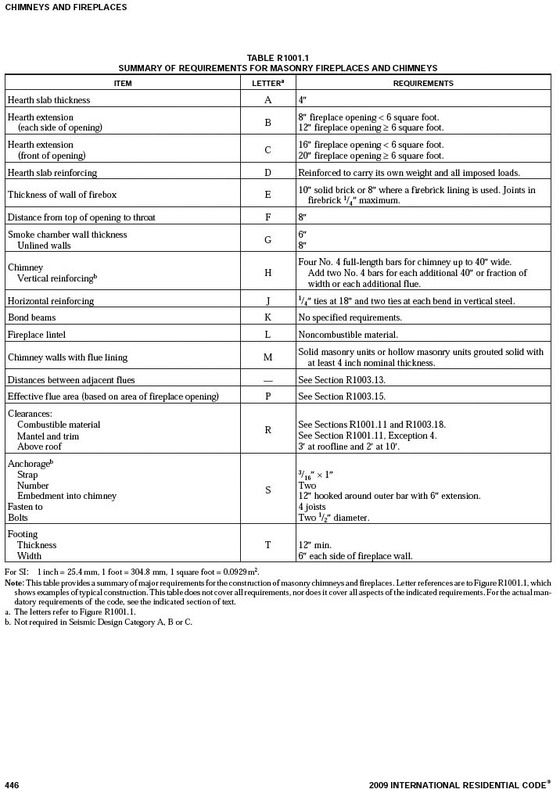 Chimney flues shall not be smaller in area than that of the area of the connector from the appliance [see Tables R1003.14(1) and R1003.14(2)]. 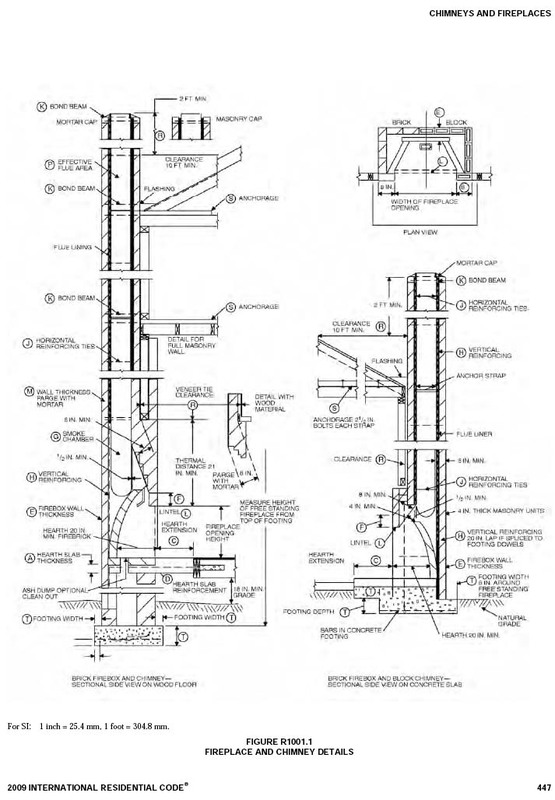 The sizing of a chimney flue towhichmultiple appliance venting systems are connected shall be in accordance with Section M1805.3. R1003.15 Flue area (masonry fireplace). Flue sizing for chimneys serving fireplaces shall be in accordance with Section R1003.15.1 or Section R1003.15.2. and R1001.14(2) or as provided by the manufacturer or as measured in the field. R1003.15.2Option 2. The minimumnet cross-sectional area of the chimney flue shall be determined in accordance with Figure R1003.15.2. A flue size providing at least the equivalent net cross-sectional area shall be used. Cross-sectional areas of clay flue linings are shown in Tables R1003.14(1) and R1003.14(2) or as provided by the manufacturer or as measured in the field. The height of the chimney shall be measured from the firebox floor to the top of the chimney flue. R1003.16 Inlet. Inlets to masonry chimneys shall enter from the side. Inlets shall have a thimble of fireclay, rigid refractory material or metal that will prevent the connector from pulling out of the inlet or from extending beyond thewall of the liner. R1003.17 Masonry chimney cleanout openings. Cleanout openings shall be provided within 6 inches (152 mm) of the base of each flue within every masonry chimney. The upper edge of the cleanout shall be located at least 6 inches (152 mm) below the lowest chimney inlet opening. The height of the opening shall be at least 6 inches (152 mm). The cleanout shall be provided with a noncombustible cover. R1003.18 Chimney clearances. Any portion of a masonry chimney located in the interior of the building or within the exterior wall of the building shall have a minimum air space clearance to combustibles of 2 inches (51 mm). Chimneys located entirely outside the exterior walls of the building, including chimneys that pass through the soffit or cornice, shall have a minimum air space clearance of 1 inch (25 mm). The air space shall not be filled, except to provide fire blocking in accordance with Section R1003.19. R1003.19 Chimney fireblocking. All spaces between chimneys and floors and ceilings through which chimneys pass shall be fireblocked with noncombustible material securely fastened in place. The fireblocking of spaces between chimneys and wood joists, beams or headers shall be self-supporting or be placed on strips of metal or metal lath laid across the spaces between combustible material and the chimney. R1003.20 Chimney crickets. Chimneys shall be provided with crickets when the dimension parallel to the ridgeline is greater than 30 inches (762 mm) and does not intersect the ridgeline. The intersection of the cricket and the chimney shall be flashed and counterflashed in the same manner as normal roof-chimney intersections. Crickets shall be constructed in compliance with Figure R1003.20 and Table R1003.20. R1004.1 General. Factory-built fireplaces shall be listed and labeled and shall be installed in accordance with the conditions of the listing. Factory-built fireplaces shall be tested in accordance with UL 127. R1004.2 Hearth extensions. Hearth extensions of approved factory-built fireplaces shall be installed in accordance with the listing of the fireplace. The hearth extension shall be readily distinguishable from the surrounding floor area. R1004.3 Decorative shrouds. Decorative shrouds shall not be installed at the termination of chimneys for factory-built fireplaces except where the shrouds are listed and labeled for use with the specific factory-built fireplace system and installed in accordance with the manufacturer's installation instructions. R1004.4 Unvented gas log heaters. An unvented gas log heater shall not be installed in a factory-built fireplace unless the fireplace system has been specifically tested, listed and labeled for such use in accordance with UL 127. FACTORY-BUILT CHIMNEYSR1005.1 Listing. Factory-built chimneys shall be listed and labeled and shall be installed and terminated in accordance with the manufacturer's installation instructions. R1005.2 Decorative shrouds. Decorative shrouds shall not be installed at the termination of factory-built chimneys except where the shrouds are listed and labeled for use with the specific factory-built chimney system and installed in accordance with the manufacturer's installation instructions. R1005.3 Solid-fuel appliances. Factory-built chimneys installed in dwelling units with solid-fuel-burning appliances shall comply with the Type HT requirements of UL 103 and shall be marked "Type HT" and "Residential Type and Building Heating Appliance Chimney." and shall be marked "Residential Type and Building Heating Appliance Chimney." R1005.4 Factory-built fireplaces. Chimneys for use with factory- built fireplaces shall comply with the requirements of UL 127. R1005.5 Support. Where factory-built chimneys are supported by structural members, such as joists and rafters, those members shall be designed to support the additional load. R1005.6 Medium-heat appliances. Factory-built chimneys for medium-heat appliances producing flue gases having a temperature above 1,000 deg.F (538 deg.C), measured at the entrance to the chimney shall comply with UL 959. R1006.1 Exterior air. Factory-built or masonry fireplaces covered in this chapter shall be equipped with an exterior air supply to assure proper fuel combustion unless the room is mechanically ventilated and controlled so that the indoor pressure is neutral or positive. R1006.1.1 Factory-built fireplaces. Exterior combustion air ducts for factory-built fireplaces shall be a listed component of the fireplace and shall be installed according to the fireplace manufacturer's instructions. R1006.1.2 Masonry fireplaces. Listed combustion air ducts for masonry fireplaces shall be installed according to the terms of their listing and the manufacturer's instructions. R1006.2 Exterior air intake. The exterior air intake shall be capable of supplying all combustion air from the exterior of the dwelling or from spaces within the dwelling ventilated with outside air such as non-mechanically ventilated crawl or attic spaces. The exterior air intake shall not be located within the garage or basement of the dwelling nor shall the air intake be located at an elevation higher than the firebox. The exterior air intake shall be covered with a corrosion-resistant screen of 1/4-inch (6 mm) mesh. R1006.3 Clearance. Unlisted combustion air ducts shall be installed with a minimum 1-inch (25 mm) clearance to combustibles for all parts of the duct within 5 feet (1524 mm) of the duct outlet. R1006.4 Passageway. The combustion air passageway shall be a minimum of 6 square inches (3870 mm2) and not more than 55 square inches (0.035 m2), except that combustion air systems for listed fireplaces shall be constructed according to the fireplace manufacturer's instructions. R1006.5 Outlet. Locating the exterior air outlet in the back or sides of the firebox chamber or within 24 inches (610 mm) of the firebox opening on or near the floor is permitted. The outlet shall be closable and designed to prevent burning material from dropping into concealed combustible spaces.